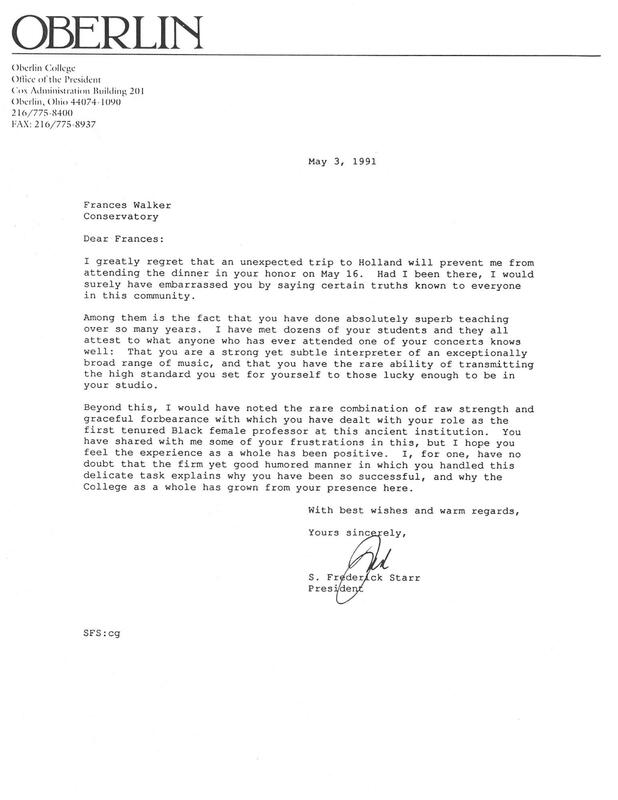 In this letter, President Stephen Frederick Starr sang Frances Walker-Slocum’s praises on the occasion of her retirement. Echoing decades of reviews, he wrote that Walker-Slocum was “a strong yet subtle interpreter of an exceptionally broad range of music.” This is worth noting given that Walker-Slocum never once performed Black composers on the assumption that they were in any way outside of the traditional classical repertoire, but in fact, completed a canon that some colleagues lost. Starr noted the groundbreaking position Walker-Slocum occupied at Oberlin, while acknowledging the way she met prejudice she encountered. I greatly regret that an unexpected trip to Holland will prevent me from attending the dinner in your honor on May 16. Had I been there, I would surely have embarrassed you by saying certain truths known to everyone in this community. Among them is the fact that you have done absolutely superb teaching over so many years. I have met dozens of your students and they attest to what anyone who has ever attended one of your concerts knows well: That you are a strong yet subtle interpreter of an exceptionally broad range of music, and that you have the rare ability of transmitting the high standards you set for yourself to those lucky enough to be in your studio. Beyond this, I would have noted the rare combination of raw strength and graceful forbearance with which you have dealt with your role as the first tenured Black female professor at this ancient institution. You have shared with me some of your frustrations in this, but I hope you feel the experience as a whole has been positive. I, for one, have no doubt that the firm yet good humored manner in which you handled this delicate task explains why you have been so successful, and why the College as a whole has grown from your presence here. Stephen Frederick Starr was the twelfth President of Oberlin College. He served from 1983 to 1994. A musician himself, Starr played jazz clarinet. Although Starr had a difficult relationship with Oberlin students, he was able to increase the hiring of professors of color during his presidency (Stephen Frederick Starr Finding Guide, Oberlin College Archives, Oberlin College, Source, accessed 15 July 2016).